When Harry first got sick, and when his herniated discs turned into insulinoma, surgery, hypoglycemia, and herniated discs, I secretly wished – but didn’t dare write it or say it – that Harry would be here for Halloween. Because I honestly wasn’t sure if he’d make it. 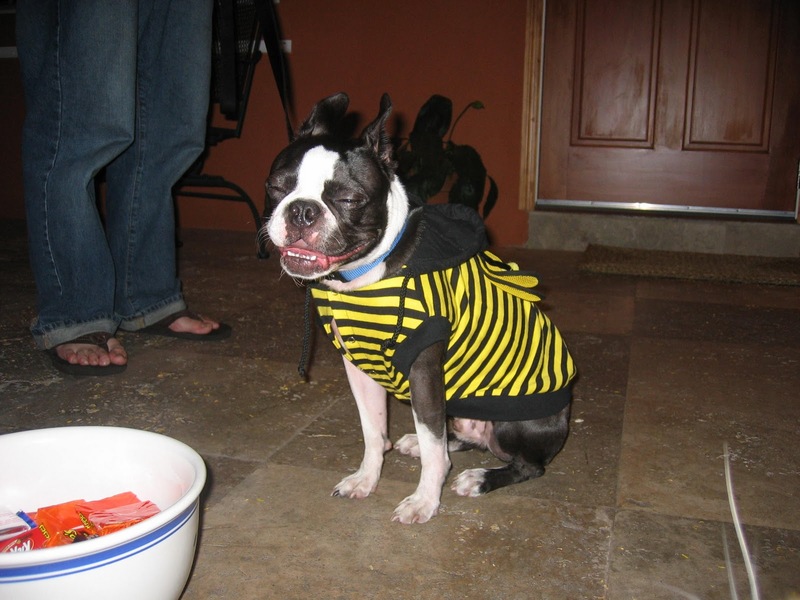 And because on every Halloween, I delighted in squeezing Harry into a bee costume that I bought when he was a puppy. I’m positive it made him want to flip me the bird, but he let me do it every year because he knew it made me the happiest Mama on the planet. Harry the Bee was my anchor. Harry the Bee reminded me that if a black & white, smush-faced dog with tall, pointy ears could dress like a bee, then everything would be okay. He told us insulinoma is rare. He saw about one dog every other year with the disease. He told us insulinoma in a young dog is rare. Harry was only eight years old. He told us fast and aggressive metastasis of insulinoma after surgery is rare. 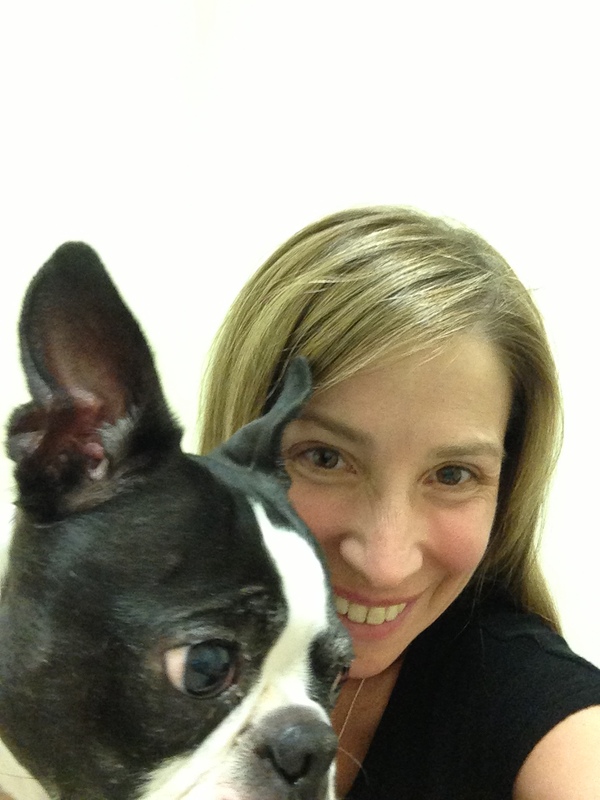 Harry’s insulin to blood sugar ratio was through the roof just a few weeks after surgery. He said he’d never seen anything like it. Dog gets insulinoma. Dogs gets surgery. Dog gets better. That’s how the story was supposed to go. Instead, Halloween ended up being Harry’s last night here on Earth. After we returned from Miami, Harry was too sick to wear the bee costume. He was too sick to eat or even stand up. I can’t tell you how many times the doorbell rang with trick-or-treaters that evening and he didn’t even lift his head. Harry fought like hell to stay with us, and we fought like soldiers to keep him here, but his body was too weak to fight anymore. He told us he was done, and we listened. After a long, arduous, and heart-wrenching night, we drove back to Miami to say goodbye to our extraordinary friend. I rubbed his front legs to help him fall asleep just like I did when he was a puppy on my lap, and with my tears dripping on his legs, I wished him sweet dreams as he drifted away, finally free of the disease and suffering that unfairly plagued his body. I could tell you about how extraordinarily awful the last few months have been. About how our birthdays were marked with fear and anxiety. About how my heart leapt out of my chest every time the phone rang. About how I cried every day. About how we raced to the animal hospital at least once a week. About how we bought pumpkins at the pumpkin patch but never got around to carving or decorating them. About how we never got more than a few consecutive hours of sleep. About how we fed Harry every two hours, even at night, to prevent hypoglycemia-induced seizures. About how I never left him alone for more than a few hours. Do you remember the season of “Lost” when Jack and the group discovered they had to type a code and press “execute” on the computer every 108 minutes to avoid worldwide catastrophe? That’s what feeding (or not feeding) Harry was like. In my mind, if he didn’t get that small, frequent, high-protein meal, disaster was imminent. His life became a burden that I carried as any loving Mama would do, but the pace at which we all, including Harry, worked to keep up was ultimately unsustainable. Losing Harry, who we loved like one of our children, was agonizing. Having to explain to the boys that their Bo Berry was gone forever was equally unbearable, but what was truly extraordinary was the way they handled the news – with grace, courage, honesty, and love. My job is to educate my children, but as usual, they teach me. When I wrote a letter of gratitude to Harry earlier this year on his eighth birthday, I had no idea it would become his eulogy. What happened to Harry was extraordinary, but then again, he was an extraordinary dog, and we were extraordinarily fortunate to have him in our lives. I will carry you forever in my (broken) heart. My heart is aching. I’m so sorry.